A Cat Toy Variety pack that can't be beat! Two of our BEST SELLERS and Cat Customers favorites in one Pack! Sparkle ball Tuff Kitty Puff® Cat toy and the real rabbit fur mouse cat toy together in one package. This Pack contains 6 standard size sparkle balls Tuff Kitty Puff® Cat Toy, & 2 Real Rabbit Fur Mouse Cat Toy. The Tinsel pom pom cat toys in Bright assorted colors from Blue, green, red, gold, white and pink. These Tuff Kitty Puff® Cat Toys are MADE FOR CATS. Made of very tightly woven yarn mixed with tinsel. The Mouse Cat toy is made of real natural gray rabbit fur. 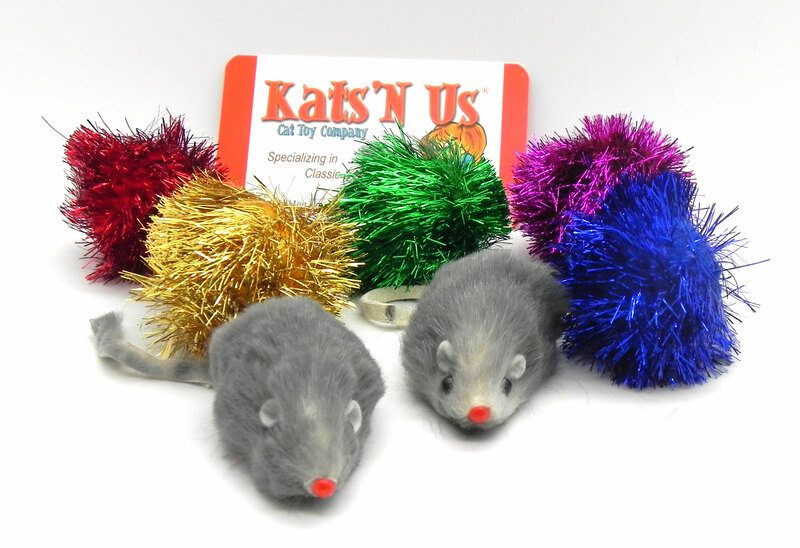 Mouse is 2 inches in length with no rattle, sparkle balls are 1 1/2 inches in diameter.